Partial Centrosaurus remains were originally found in 1876 by a man named Edward Drinker Cope and named it as Monoclonius fossil. This was actually incorrect and in 1904 through much research Lawrence Lambe studied the fossil that copes found and thought that it was a new species. After Lawrence discovered a frill section the puzzle came together and this was not a Monoclonius, it was a new dinosaur. So he named it Centrosaurus. Since then many remains of this dinosaur have been found in Alberta, Canada. 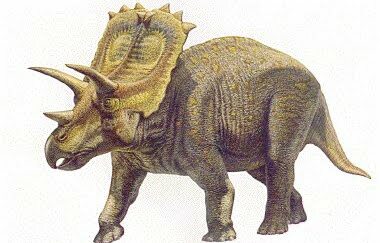 Centrosaurus had a horn pointing out just like a Triceratops. It also had spikes around a neck frill, strong hind legs and arms, hooves, and thick armor. The Centrosaurus was thought up to be a herding dinosaur living in groups because when there was one found, always more where close by to be discovered.